From Quantum Mechanix. Now this gleaming, screen-accurate replica can be yours. 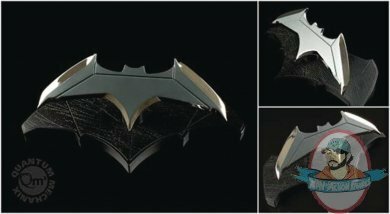 QMx Caliber Metalworks proudly presents the Batman Batarang 1:1 Scale Replica as seen in the movies Batman v Superman: Dawn of Justice, Suicide Squad and Justice League (2017). Developed from the screen-used prop, this Batarang has the commanding look and feel of a premium collectible. Cast in a sturdy zinc alloy, this authentic replica sits atop a magnetic stand that mirrors its iconic shape. The Batman Batarang 1:1 Scale Replica is a must-have addition to your collection.